Today I am bringing you an exciting installment for my Father's Day gift series in the form of the recently released Braun Series 5 5040S Wet & Dry Shaver*. I was kindly sent a sample to review and will also be looking at a few of the other different models at different price ranges to fit all budgets. The shaver can be used wet or dry and I've read that foil head lasts around 18 months before needing replacement but that careful cleaning and maintenance can mean they last much longer. That's something to bear in mind to help maximise the potential money saving in switching from disposables and that's not to mention the better quality of a shave a more high end model can offer due to the enhanced technology. 1. Flexibility- he was a big fan of the pivoting head which allowed for a comfortable but close shave that was more of a fluid motion. It was also good for picking up small hairs or any flat lying hairs that can sometimes be a bit more tricky to get at. 3. Battery - he thought it was great you can have a full shave on a 5 minute quick charge or 45 minutes on a full 1 hour charge. 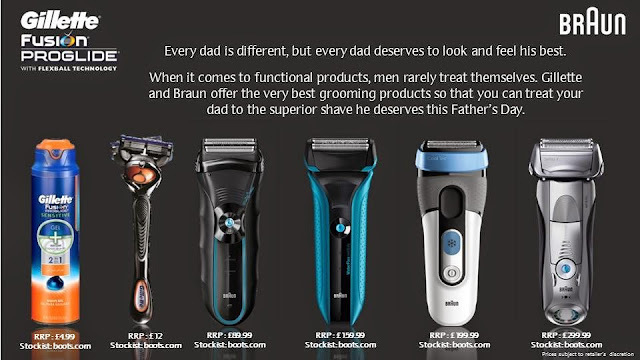 I hope you found this useful if you are thinking about investing in a shaver for your dad or any male acquaintance, he had nothing but good things to say about it and I haven't seen him use anything else since, which is very telling for a man of such particular taste. As promised, I've included below a little selection of a few different shavers of varying price points that are all available from www.boots.com so hop on over there or check them out in store. Think of all the advantage card points you can clock up! I hope this was helpful for you all. Thanks for reading and speak soon! I think havig the possibility of using during shower, that your dad said, is very good, therefore, a great product and I may buy one for my brother on his birthday! the battery life looks great on this!